Paradise Ransomware is not as sophisticated as some other ransomware infections spreading through the web these days, but it might still become your worst nightmare because it is also capable of encrypting personal files and does that right after the successful entrance. We are sure that it locks files because it wants users’ money. If you have already found a bunch of your personal files encrypted, it does not mean that you should go to send money to ransomware creators because the chances are high that you will not get anything from them, and, in such a case, the refund will not be issued for you either. You can send them 3 files to get them decrypted for free if you want to, but you need to find an alternative way to decrypt the rest of your files. For example, it is possible to restore the encrypted data from a backup. Before you take any action to get your files back, you need to remove Paradise Ransomware fully so that it could not encrypt your files again. You should find it easier to delete this infection from your computer after reading this report till the end, so continue reading! Paradise Ransomware has been developed with the intention of obtaining money from users easier, so the first thing this infection does following the successful entrance is the encryption of files. Your files have already been affected by this threat if they contain a new .paradise extension at the end together with a random string. Users are, of course, not kept in blissful ignorance. They discover a new .txt file (#DECRYPT MY FILES#.txt), which is a ransom note, in all directories containing encrypted files. The ransom note informs them that they can no longer access a bunch of their files “due to a security problem.” Additionally, they find out what they can do about that. Users are told that “paying for decryption in Bitcoins” is the only way to get files back. The exact price is not indicated in the ransom note, but users are told that the size of the ransom depends on how fast they contact cyber criminals by the provided email address info@decrypt.ws. If you make a decision to purchase the decryption tool from cyber criminals, do this as soon as possible because the decryption key they have will be destroyed after 36 hours. We hope that you are not one of these users because paying money to cyber criminals is always a bad idea. If you send them money, it does not mean that you could unlock your files because you might not be given the decryption tool. As has been mentioned in the first paragraph of this article, the only way to unlock files for free is to restore data from a backup. Sadly, there is nothing else you can do. Although Paradise Ransomware has not infiltrated many computers yet, specialists at pcthreat.com are 99% sure that this infection arrives on computers illegally. It is usually spread via spam emails as an attachment, but it could have entered your system in a different way too. Users usually contribute to the entrance of this infection by opening a malicious spam email attachment or downloading the ransomware infection from some kind of dubious page. No matter what the reason you have it on your system is, you need to remove the ransomware infection as soon as possible even though it is not considered very sophisticated malware because you might launch it again accidentally, and it will definitely not miss a chance to encrypt your new files. When Paradise Ransomware is erased, install a security application on your computer so that similar malware could not enter the system ever again. You should not find the Paradise Ransomware removal procedure very complicated because this infection does not drop any additional files. It means that you could delete this ransomware infection from your computer by simply removing all recently downloaded suspicious files and the ransom note belonging to this threat. Our manual removal guide will help you to take care of this infection manually, but, of course, you can adopt the quicker removal method too if you want to – scan the system with an automatic malware remover. Delete all recently downloaded files that might be linked with Paradise Ransomware. 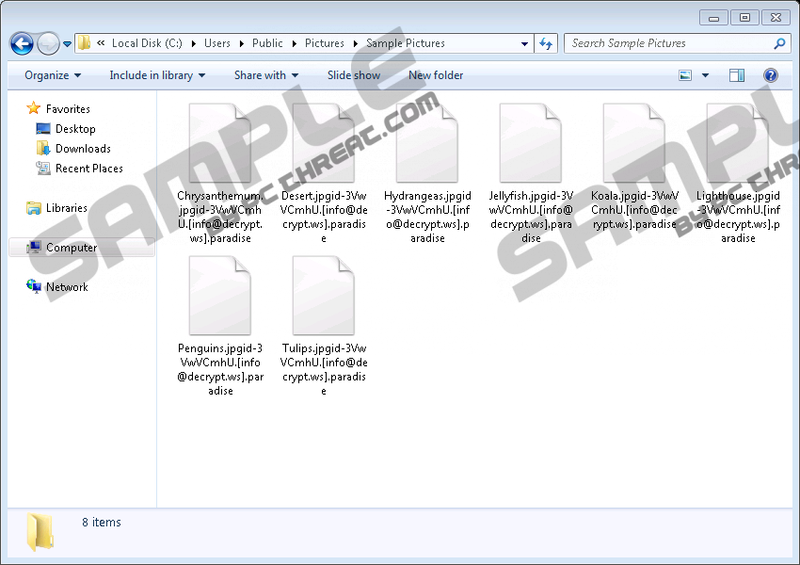 Remove the ransom note #DECRYPT MY FILES#.txt. Quick & tested solution for Paradise Ransomware removal.